During the Second Helpings project, the Wabash contingent worked with rescued food to prepare nutritious meals for Second Helpings to distribute. Second Helpings accepts donated perishable and overstocked food to prepare nutritious meals for thousands of hungry children and adults every day, and distributes them free of charge through local social service agencies in Greater Indianapolis. 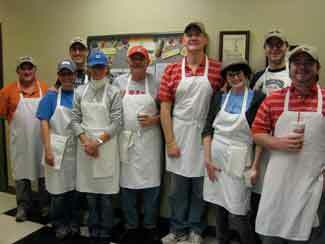 Second Helpings also trains unemployed and underemployed adults for meaningful careers in the culinary industry. Our Wabash Day group prepared a pork and beans dish, washed dishes, swept and mopped floors, and wrapped and prepared over 500 lbs of meals for Second Helpings to send out over the following couple of days. We prepared enough food to feed hundreds of people all over Indianapolis. Our group consisted of nine Wabash volunteers.